It's almost 11 pm Wed. now when I'm writing this. Sorry if it's a bit scattered. Tuesday I worked on sermons for funerals and memorized my sermon for this mid-week lenten services. I also finished up planning for Thora's funeral. My loving wife and children have been practicing hymns for both funerals. We had worship at Mt. Olive, texts Mt. 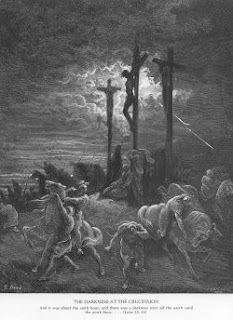 4:1-11 and Genesis 3. The sermon for this week's mid-week worship focuses on Christ succeding where Adam and Eve failed and His substitution of His works for ours and our punishment placed on Him. Bible Study was great: good questions and discussion. Wed. working on sermons and service planning for the funerals and devotions. From Tuesday to Sunday I have 10 services to hold: 5 different sermons; and 2 Bible Studies. Wed School devotion and class went well. We had a chilli feed at Oak Park this evening before service. Thanks to Kelley, Darrow, Connie, and Shirley for helping me finish the bulletins for Verner's funeral. Service went well. The lenten readings this week go from Jesus' annointing at Bethany through the Supper and the discussion after the Supper. Then many of us were off to Thief River Falls for Verner's visitation. I held devotions and presented a Homily on I Thess. 4 and the Resurrection. During Wed. School I was notified that Ernest and Cora were hospitalized, so I went to the Hospital on the way home and checked up on them and on Mable. Cora is in the CNC because Ernest is not able to take care of her. She has the beginning stages of Alzheimers. Ernest's diabetes is getting the better of him. He has a bad sore on his leg that they need to treat. Mable is doing well and will probably be transferred to the CNC fairly soon. Then I picked up a few groceries and came home. We're under a Winter Storm Warning tonight through Friday. I don't think the weather will be bad enough to halt the funeral tomorrow morning. But it's supposed to grow worse through the day. Wind and Snow, go figure! It's February and we're in a very flat spot without a lot of trees to stop the wind. I've got some pictures of the kids, but those will have to wait for another time. Icy roads this morning, but no wind. It was snowing nicely early on when I went to TR. I met Verner's family at the funeral home and we did some planning and reminiscing. Afterward I went to see how Louella was doing. Her late husband was Verner's brother. The couples were close. Verner's funeral is Thursday at 10am at OP. Visitation at Green Funeral home Wed 5-8:30 with devotion at 8:30. I picked up lunch at Johnnie's and went to see how Ragna was doing. Ragna is Thora's sister-in-law. She's still got a bit of a cold and caught, but she looks pretty strong. I went to the library and picked up a couple of Cirque du Soleil performances. Then to the store to get some necessities, and home. The roads were mostly nice late this afternoon going home. 32 degrees and sun melted a lot on 59 and the River Valley road. 330th Ave is still yucky. Did some sermon writing, had supper, and watched Alegria (Cirque du Soleil). 93 minutes of awesome. Mary didn't like the contortionists, but wow, what an aesthetic musical/ dance/ acrobatic/ circus/ mime synchronicity. Unfortunately, now Elsie wants to be a contortionist when she grows up. Back to the office now to work on sermons again. Quite a gang is here at Church for Social Club tonight. J'espère que vous appréciez le Cirque. A bientôt. Minnesota: Mankato, Kasota, Princeton, Lismore, Bagley, Gardner, Winger, Warren, Trail, Karlstad, and a bunch more. Verner passed away this evening, about half an hour ago. He is now with the Lord and able to see Mildred again. Please keep his family in your prayers. We'll get together for funeral planning tomorrow. Before Mildred died, Verner and Mildred would bring all kinds of treats to the Parsonage. Mildred would find some chokecherrys or high-bush cranberries for me to make into jelly. 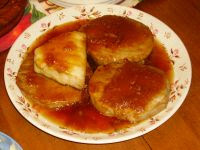 Each spring Verner would bring around several catches of Northern Pike for us to cook up. Mildred had cancer back in the early 1970s. She and another woman were given a new type of radiation treatment. In Mildred's case they overdosed her and she ended up loosing her arm and shoulder. The other woman died of cancer soon after. Mildred lived another 30 years. 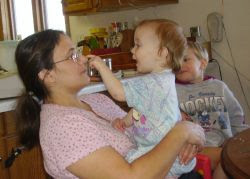 Yes, she experienced some great pain with her injury, but she did not regret the time she was able to spend with her family. I buried Mildred almost 3 years ago now. In the months before she died Verner had started to develop some memory problems. They loved each other so much they would worry each other out. Verner would worry about caring for his beautiful and fragile wife. Mildred would worry about what her devoted and loving husband might have left on. About a month before she died Verner's memory problem became serious. Mildred moved into TR and Verner had special care. Mildred passed away soon after. Verner's loss was deep and sharp. Verner experienced more problems with his memory and some possible strokes. Over the last 3 years each time I would visit him I'd hope for that little spark of recognition. Once in a while it would come, and we would value whatever small amount of time we could actually converse with each other. But his health had been failing. Last fall we worried that he wouldn't make it. But God allowed us some more time together. Yesterday we prayed that God would care for him and deliver him from his suffering. God answers prayer. I am truly thankful for the time that I was allowed to know Mildred and Verner in this world, and I look forward to seeing them again at the Resurrection of all flesh. We started a little late this morning and held a longer family devotion. Around 10:30 Kyle managed to get through to plow out the church parking lot. But the main roads are still dangerous and most of the side roads impassible. The drifts in places are as high as 4 feet. 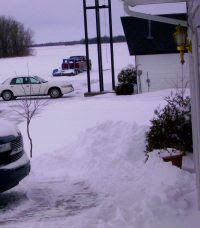 The driveway and parking lot were covered with 1 to 2 feet of snow. Around the house it was higher. Of course the kids wanted to be out in it. Sophie came back in before the others. She has this tendency to forget to wear socks in her snow boots. That kind of gets her ankles cold. She came in looking like a wet puppy. But she warmed up by snuggling with mom. another several inches today. 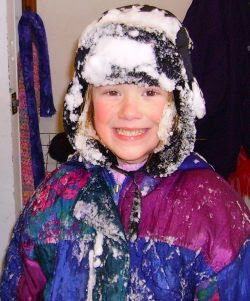 Louisa managed to replace her hat with a head full of snow. 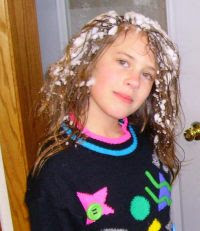 So, Madeline, how much snow do you have? I bet you got more than we did. Now, can I keep them from loosing the shovels again today? I suppose there are several families who have the "missing tool" problem. Just so they don't end up inside a snowblower. Clara came in with icing all over. Elsie and Matt brought in more. We had them shake it off in the mud-room, sweep it up and drop it in the sink to melt. It's early afternoon now, more snow is falling. Thankfully the wind has dropped down for now. I keep checking weatherunderground to see what this weather is doing. It looks like a coriolis that keeps bringing snow over us and will continue to do so for a while. I'm going to use the time for service planning and getting my mileage logs to the taxman. Saturday morning we were greeted with a sheet of ice covered by thick dusting of dry snow and high winds. I went outside to check travel conditions and fell on my rear. I called down to Trail to check conditions there. The ice was thicker and just as slick. So we called off church at Mt. Olive. Before noon I got a call that Verner was doing poorly and might be dying. So, after noon meal Mary and I made a very long drive to TR. Normally it takes less than half an hour, TR is only 26 miles away. Today it took an hour. The roads were slick except for Hwy 59. Snow was falling heavily and the windshield kept getting covered. We stopped to see Mable at the Hospital. Edwin, Ione, Glen, and Linda met us in the lobby. Mable was doing well. Her surgery went very well. They did a partial hip replacement and hope to have her sitting up tonight and on her feet tomorrow. Hopefully they can find a space in the CNC for her to finish therapy and recovery. Again, like with Esther, I am amazed at what can be done today for the elderly. Just a decade ago a broken hip was a death sentence. Now, it's surgery and a few days of therapy, then go home. Thank God. Please keep her in your prayers. I dropped Mary off at Ben Franklin and went to see Verner. His daughter was there. Verner has some kind of infection that makes his temperature vary at extremes. He needs lots of oxygen. He was able to wake up for a few minutes while I was there. I had devotion with them. I'm not sure if Verner recognized me. But God works through His Word according to His promise. Please keep him and his family in your prayers. I took the opportunity to visit Gertrude while I was there. She seemed fairly aware today. She is doing much better after her respiratory illness. Her hair looked very nice, looks like she had a permanent yesterday. She's 101 years old and delicate. She can't really see and she is very hard of hearing so communication tends to be slow. But she was able to pray the Lord's Prayer with me. Please also keep her in your prayers. The snow was falling pretty steadily. 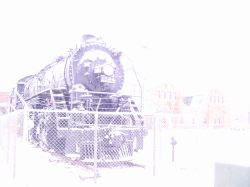 I stopped to get a picture of the old SooLine engine at city hall. The photo is a bit overexposed, but the snow was also thick. We made a quick stop at Wal-Mart to get a few things and took the long journey home. We had to stop to clear the windshield and wipers on the way home. The storm is growing worse. Now I need to get the cramps out of my upper back an neck. When we got home the girls were playing in the snow in the ditch. The snow was falling so fast that they lost the shovels they had taken out with them. Late this evening Oak Park's chairman called and suggested we cancel services tomorrow. Our township doesn't get plowed as soon as some other areas in the county. I called the Nazareth chairman and he also agreed to cancel services. Nazareth will be impossible to get at in the morning at the time church is scheduled. I went to the neighbor's place to have Confirmation class and to check the roads. With my all wheel drive I almost got stuck several times. The combination of drifts with slick ice underneath makes me doubt whether I can get up to St. Petri in the morning. So I called off church there as well. Then I went out with the girls to find the shovels. We found them. They were buried pretty deep. The storm warning/travel advisory is supposed to continue to 6pm tomorrow. We went to Fosston to get our taxes done. My milage and expenses were on a hard drive that died a couple of weeks ago. I spent some time trying to rescue the data, no joy. I'll have to get the logs and receipts out and do it up again. That's the great thing about paper and pencil. They don't crash and loose all your data. Well, I have been known to lose my notepads. Anyway, the Fosston paper had a funny headline: "Timber wolves to loose, endangered listing." I guess that the wolves got loose and their listing is endangered. Got home in the late afternoon. Phone calls and a visit at the office. It looks like Thora's funeral will be Friday or Saturday, probably Saturday. Please keep her family in your prayers. Late in the evening I got a call from Arlen. Mable fell and broke her hip. Her family got her to the Hospital and she'll have hip replacement surgery tomorrow morning. Please keep her in your prayers. Storm's a brewin' tonight. Already there is a sheen of ice over everything. Thursday and John's rash was much worse. Because we had stopped giving him the amoxicillin yesterday morning we thought it'd be best to have him checked out. 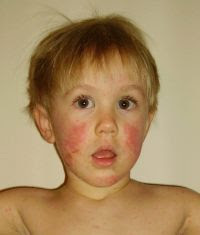 The pattern of his rash looked a lot like the patterns shown and described for Scarlet Fever in the Mayo Clinic book and in the online medical websites. After a long, cold drive, relief. It was just an allergic reaction. No Scarlet Fever. Thank God. Matt, Louisa, and Clara came with me for worship at St. Petri this evening. Some icy roads on the way up, but north of Goodridge the roads were clear. They appear to have not received as much rain. Home late, grab a bite. Catch up on messages. Thora passed away yesterday morning at her home in Freemont. Funeral arrangements are pending. Active morning, busy afternoon. We had ice storms here until around 10am, then at 1pm the winds started picking up to about 25mph. John reacted to the amoxicillin today. Hives and blotches all over. 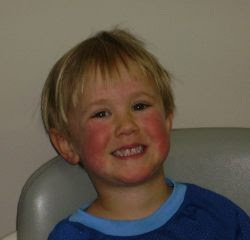 At first we thought it was chicken pox, but he's been immunized and there are no pustules. The red spots vary in size, they tend to itch, but they don't weep. Most likely, its the amoxicillin. Poor kid. He has it on his face, back, chest, tummy, arms, legs, hands, scalp, and feet. We gave him some benadryl before bed. Church at Oak Park tonight, with Bible Study afterwards. 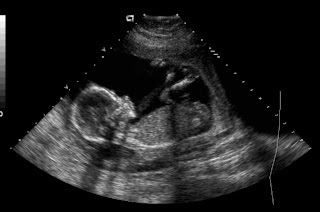 Here we have an arm or something up by the face and it looks like the baby is sucking his or her thumb. 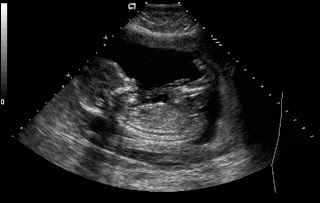 The head is on the left, the belly and legs on the right. This and the next are pretty standard side shots of the baby. Each one has a bit different detail visible. Here you can see the knees tucked up toward the face with the feet up, pushing. We don't have any names picked out at this point. Louisa has been having a field day checking name books out of the library. I'd say she's excited. In this one you can almost make out the right ear, the nose, the lips and mouth. 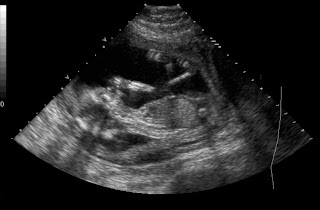 You can see the spine, the legs and toes, and knees, and the little twisting of the umbilical cord just above the stomach. I had church at Mt. Olive tonight, followed by Bible Study, and a visit. Got home late, got to bed even later. I'm trying to see if I can get a YouTube video to work from this site. This video is from Monday, with Stella falling asleep while eating Pizza. if the above embedded movie doesn't work. The Youth group retreat worked out nicely. I did a Bible Study on the Jehovah's Witnesses and the Holy Trinity. We got home around 1pm. Jeremy and Matt slept til 6pm. I did some sermon work that afternoon and copied Bible study worksheets. Today was the first morning in the last 4 that I woke up without a fever. I made it through the three services today, but my throat is very raw. We used the order of Prime and I had a deacon do the readings for the day at each congregation. I preached the sermon. When I got home we had lunch. Stella was doing so well with her silerware today, but after just a few bites, BAM! There she was, slagged over on her side. Now, I don't blame her. 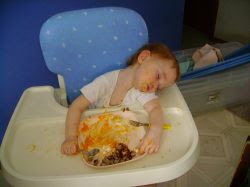 I was falling asleep at the meal too. Mary was teasing me about that. So I went to bed and slept until just before I loaded up the LYS kids and took them to the Youth retreat in Fosston. We had almost 40 kids at the retreat. I only stayed for a short time in the evening. I had to get back home to photocopy, collate and staple my Bible Study. Then I slept again. Hopefully my voice would be better in the morning. 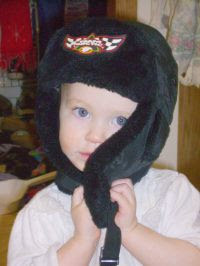 Stella got ready for the United States Cross Country Snowmobile Racing Association's Red Lake I-500, which took place this weekend. My voice was too sore to preach, and Pr. Stafford took my service at Mt. Olive this morning. Thank you, Pr. Stafford. We didn't go to watch the race. They did it on the Red Lake river this year because the snow cover is so uneven on the regular course. Well, Mary is a good shopper. And she looks for deals. Well, we found some Tuna and Marlin steaks on sale a while back at a really good price. We broiled the tuna and marlin in the oven. I made a brown sugar, pepper and burbon sauce for some of the fish. Only a few didn't like the sauce because it tasted funny to them with the burbon in it. Most of us liked it quite a bit. 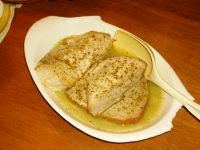 Mary made a lemon, pepper and herb sauce for the rest of the fish. That also was excellent. I finished up writing my bible study for the youth retreat this weekend. I hope my voice holds out for church tomorrow. I'm goint to try to do the services. I used the shredded end fibers I trimmed from the end loop to make the serving for the bowstring. It wasn't really difficult. After separating out the shreds to an even and somewhat fine fluff I was able to twist a new thread out of the material and wrap the thread around the bowstring at the nocking point to make a fairly decent serving for the string. You can see the raw fluffy fibers just below my right hand. 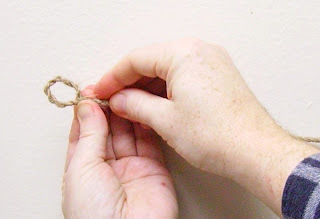 I twisted it into thread at the same time I was wrapping it around the string as a serving. I probably should have done this with damp or wet fiber. It's my first attempt, so I'm sure that it will shake out fairly quickly when the string is vibrating under tension. 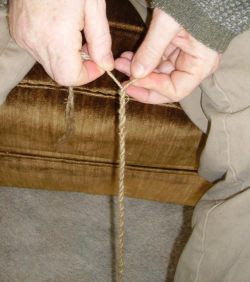 We left the tail end of the right side where it would join the main string out of the main string yet at this point. Now we twist the left side. Going down this side the new piece of string is twisted counter-clockwise. Remember, it's the other end of the short piece we twisted clockwise on the right side. We want to keep it twisted consistently the same direction along its length. So now at this end we twist counter-clockwise and wrap clockwise. The tension on the bowstring from its original twisting will help in this wrapping. Now were down to the base of the loop and want to incorporate both of the tapered ends. At first we will open the loop up a bit more and twist and wrap each side the same way we wrapped each of them before. Sometimes this takes a few untwistings and re-twistings to get the tapered ends to melt smoothly into the main bowstring. Put your finger in the loop and pull tight to help the newly integrated piece to set nicely. And now we have a loop that has the same strength as the main body of the string because it is reinforced with the new piece. OK, Thursday evening, while we were all sick, I put my hands to work on a second bowstring. This one only took about 20 minutes to twist up. I put on some music, מרי מסיקה ואתנקס ודנה ברגר ומיקה קרני all of them Israeli pop. The girls like דנה ברגר and מרי מסיקה the best. So my quest after making the new string was to go from the simple starting end to a reinforced twisted 2x3 ply loop. 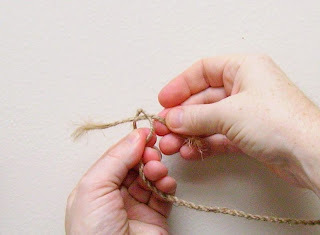 Start by taking a 6 to 8 inch piece of 3ply and thin the two ends by scraping them with a knife. The goal is to taper the ends to nearly nothing while leaving a 2 inch stretch in the middle that will reinforce the loop. Then the starting end is opened up into a loop. 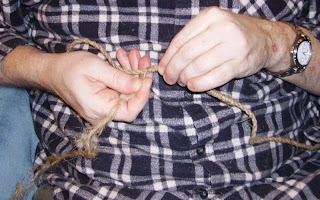 The strands are pulled apart, not untwisted. This forces the twists tighter down into the string. The energy of the twists will be needed later to help keep the thinned ends of the new piece under friction. The new reinforcing piece is placed in at the top of the loop. The new piece will be twisted into the sides of the loop from the center top down each side. Remember that the twisting of the new piece is in the same rotational direction that the original string was twisted. I twist clockwise ending up in a 2x3 ply that twists around itself counter-clockwise because of the string memory. Taking the right side I twist the new strand clockwise and wrap it counter-clockwise around the right side of the bowstring loop. The tight twisting of the bowstring helps this to be an almost automatic twist. At this point we'll leave the tail end when we get to the end of the loop. We'll twist that in after incorporating the new piece into the left side of the loop. Here is a map of places from where people visited this past week. This is just the family blog, not diatheke. A new one from Jilin, China. A new visit from Monroe, LA. In the lower Midwest: a city named Harvel, IL (South of Springfield) and Pana, IL (near Harvel), Batavia, IL. Out west, in Oregon: Hood River, West Linn (by Portland), Forest Grove (also by Portland). In Washington: Everett (Rachel? Mike and Shawna? MLE SQ? ), Wenatchee (Sara? Bud and Joan? Paul and Lois? Who?). In Montana: Bozeman, MT (welcome back, Jessica and family). In Minnesota- Lismore and Jasper (both by Worthington and Luverne), Minneapolis, Princeton, Managha, Winger, Detroit Lakes, Bagley, McIntosh, Fargo, Strathcona, and Trail. In Wisconsin: Gresham, and Menominee. I put up a link to the Fosston Theater so you can see what's playing in our area. The TR theater doesn't keep their website up to date. Say, are any of our family willing to do a multiple blog to keep family news in one area? I heard from Rachel expressing interest in such a thing. If any of our relatives are interested, please let me know. 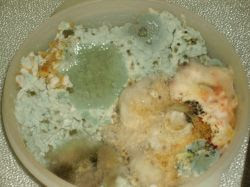 Alright, here's what you need to know to appreciate how gross this is. First, there are hundreds of cases of strep right now in our area schools. Second, in one of these schools the teachers had the children frost cookies to send over to our troops in Iraq. Well, by Wednesday bedtime the other two kids showed the signs of strep infection. So, we're 100% infected. 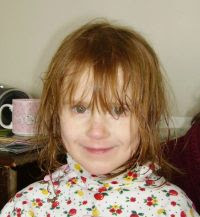 Thursday, Mary ran to Fosston and picked up two more prescriptions for the other two kids. Man, this strep just nocks you out. Combine that with sinus infection/cold stuff, ugh. Totally unproductive day. I didn't go to Winkel. I stayed home and kept most of my family resting. 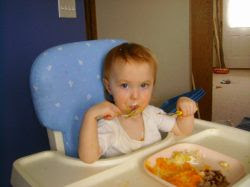 Mary was laughing at me because at our noon meal ("dinner" in the midwest, "lunch" most other places) I was falling asleep at the table as quickly as our 1 year old. Unfortunately, with the sickness comes crabbyness. 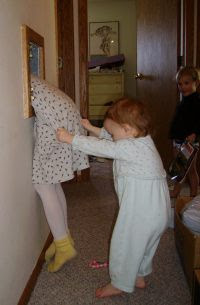 So, we work to keep the kids from biting each others' heads off. Original sin is such a helpfull thing. Thurs evening I twisted another bowstring. This time it only took about 20 minutes. No blisters this time, but my nuckles were pretty achey during the process. That's probably due to the strep more than just the motion. Friday morning I ran down to the office briefly and talked with Alyssa about things for the bulletin. We're still mostly trying to rest and keep drinking fluids. 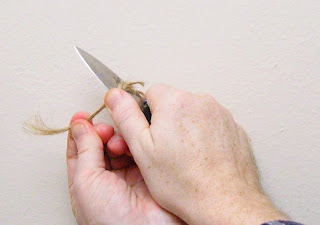 If I have the strength later on, I'll put the pictures up of how to twist a bowstring. I've gotta put together my Bible Study for the Presidents' Day youth retreat. It's not a really big deal. 45 minutes dealing with the doctrine of the Trinity and how the Jehova's Witnesses differ and err. For the past few years I've lead the "Morning Stretch" at 7am. But I think I'll need to miss that this year. Well, a reader from the deepest South of Texas emailed me. Pr. Sauer, welcome aboard. And God bless. Oh, I took the "How Lutheran are you?" Quiz. Here's my score. You are 100% Lutheran! This is most certainly true. "Yep, Strep. Amoxicillin 3x a day 'til it's gone." No visits today, no Wed School. Alison came over to help paint. Her family has been through the Strep. Our Dr. said he's had more cases of Strep this past 2 weeks than he's had in the previous 2 years. Just in the Bagley schools there's been over a hundred new cases in the last two days. Our family is 80 percent infected (8 out of 10 of us). And we're to keep a close watch on the other 2. I find that hot peppers are a good sinus relief. So I cooked up some really hot lemon-curried rice with shrimp, peppers, rosemary and sausage. Being rather proud of my cooking I went back to where Alison was painting and offered her some. She told me that my cooking smelled worse than the paint. I burst out laughing. So much for my pride in my cooking!! But I enjoyed it. Yum, Yum. Though, I must say, it is a difficulty for any of us to swallow anything today. We are now a highly medicated family. I won't be attending the Winkel tomorrow. When I woke up this morning my mouth was dry. I haven't had that happen before. I could tap on my tongue with my finger and it was like rough card board. After a bit of reading I found out that this can be caused by streptococcus, the same thing that is giving me strep throat. We had plenty of kids coughing, wheezing, whining, sneezing, and crying through the night. It's a day of fevers, aches, and pains. We stocked up on the disposable paper goods today. I'm ill today. Fever, aches, shivering, head-rush when I get up, sinuses in pain, throat raw. I spent most of the day sleeping, except when the girls decided they wanted to demonstrate their new song for me. There were a lot of percussion instruments, each one loud, each one to its own inventive meter. There was one guitar. After they were done, I asked Louisa if I could tune the guitar. In spite of my illness, I enjoyed their performances very much. Well, we're out of Kleenex and the Kleenex on a roll is running shy. We'll have to stock up. I got carded at Wal-Mart when I bought Sudafed. At least the meth manufacturing is not as prevalent in this area as it had been. Now if there could be a way to stop the trafficking. I'll try to get out tomorrow morning for a couple of shut-in calls. We had 38 different visitors to this blog on Monday, 12 on Diatheke. The visitor from Santa Maria is not in Mexico, but Texas. Bud and Dorothy, is that you? Santa Maria is about 18 miles west of Brownsville, just up river. We have at least one new reader in Portland, Oregon. And it looks like some of our relatives have checked in from Wenatchee and Everett, Washington. Who's down in Jasper, MN? There's a reader at Strathcona, MN. Welcome, y'all, youse, or you all, however it's said where you are. Drop a line sometime. The address is ibnabraham at yahoo dot com. Change the address to make it legit. Well, my joints are all screaming in pain for having sat up this long. Back to bed with me. 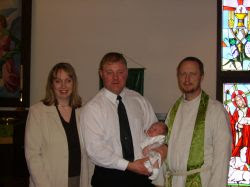 Sunday we celebrated Owen's baptism at Oak Park. May God keep him in the Covenant He has made with Owen through the Water and the Word. The temp was a nice tropical 5 below so all three services went on as planned. Communion at St. Petri, Owen's baptism at OP, and communion at Nazareth. Helen and Esther are doing better. Esther was to have been discharged today. Helen is still under observation but doing better. Henry and Betty are going on a long trip this week and next. Their kids are driving them around on a vacation. We wish them God speed and a good time. The youth group went sledding at Bemis hill after church. Our family was too ill to go with. Monday was pretty dragged out with sore throats, body aches, runny noses, and low grade fevers. Mary and I were listening to Public Radio this weekend. It's their February pledge drive. So it's actually a good time to listen. You see, during the rest of the year Public radio does maybe 1 or 2 politically conservative shows every few weeks. During the pledge drive they put all the conservative shows together and run them. I guess they figure that it's a better investment for them to tick off the liberal listeners during pledge drive and try to appease the conservatives. For example, take the program "Word for Word" here is the list of their recent programs; you can listen to the programs at the site. Everything before the pledge drive is from the extreme left. But during pledge drive they had Dinesh D'Souza's Commonwealth Club speech "Liberals Empower Terrorists" podcast here. It's a great speech. There is another fairly conservative program in the list of recent programs, David McCullough's "Why History Matters." But, that was aired during a pledge drive as well. If you are a blogspot or blogger.com blogger, here's a nice article on backing up your blogs. "Beep Mama's nose!" Man, you should hear Stella jabber and sing now. I don't remember if it was last night or the night before; Stella woke me up by crying. Soooo pathetic. "Mama,.....Dada,.....waaaa-aa-aaa-uh." I went and got her. She had climbed out of her crib an was resting on top of a box. Probably not too comfortable. Well, we've all still got this sinus/cold/congestion stuff. And it affects Stella, John, and Sophie quite a bit. And because it affects them, Mom and Dad can be grumpy in the morning. That is why a nice little interchange like the one in the picture is so refreshing to us right now. Friday I got a call that Helen is in the hospital. She'd had a stroke Thurs eve but they were able to get that new anti-stroke medicine to her in time. When I saw her Friday she was pretty groggy, but she had muscle control. She's in the ICU right now. Keep her in your prayers. Saturday, 25 below zero, no church at Mt. Olive. Catechization is rescheduled for next week. Ray was having some problems today. His brother and I went down to see him and try to find out what was going on, spend some time with him. Ray's memory is becoming worse. In the past week and a half he looks to have aged quite a bit. Please also keep him in your prayers. Baptism tomorrow at Oak Park. Meal afterward. 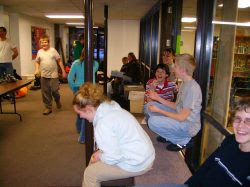 Youthgroup sledding afterward. I got an email from a reader in Troutdale, Oregon. Thank you for the email. I put this photo here to show you that we were on the north side of the Gorge last summer. We came down through Washougal, I think. Probably about 20 miles from you. Then we went over to The Dalles to visit the Jacobsens. Have you been to this museum? We liked it quite a bit. 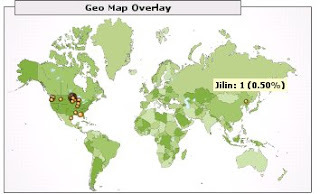 We added Dasha and Shanxi China to the list of readers from over seas. Xia-xia. A new reader from Santa Cruz de Tenerife. Santa Cruz de Tenerife "(2005 population 221,627) is a Spanish city on the island of Tenerife, the largest and most populated of the Canary Islands" (from wikipedia.org). Looks like a nice place, off the northwest coast of Africa. Hello! Please write. Another reader, maybe the same person, from Beijing. But it is a big city and there are a lot of computer crakers that operate out of there who might just be trying to crack google's blog sites. If the person from Beijing is not a cracker but a reader, I'd really like to hear from you. There are people from Jaspar, MN; Gresham and Haugan, WI; repeat readers from various places in Washington State (at least some of whom are relatives.) And several others through the U.S. Please let me know who you are. Members of my congregations have also wanted to find out who you are. My address is ibnabraham at yahoo dot com. Change the address to make it right. Thanks for reading. We had some run around Wed. evening. I had different people calling me about issues until fairly late. My member who fell off the ladder is doing very well. He may have some problems with his back. But the surgery on his wrist seems to have gone very well. He may get to come home this weekend. One of the calls was that Esther had a fall on Tues. She broke her hip. Wed during the day they did surgery, and she should be out Fri. or Sat. I went to visit her today (Thurs) in the Hospital. We also picked up our van from Jeff in Clearbrook. It works great. It's even clean! I caught Clara hugging Stella. 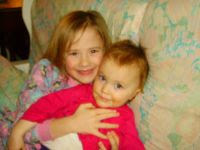 I just liked the picture, even if it's a bit blurry. Josh is doing better. He can start to eat more regular food. He's become kind of a folk-hero. There's still a bit of soreness. I thought of taking a picture of the piece of his tongue that is still in my freezer and making a Macromedia game where the viewer would have to peel it off a post and put it back on Josh. But I don't have that kind of time. But I bet if I did make such a game, Josh would play it. Tuesday was pretty active for us. In the morning Louisa fell and hurt her wrist. So we kept a watch on it during the day. I did some writing in the morning. After noon I took Elsie and Matt to TR for shopping and visits. When we got home at 6:30 Mary and Louisa had already left for the Dr. Turns out that she has a sprain. Mary and I thought it might be more serious because of the kind of pain and coloration. 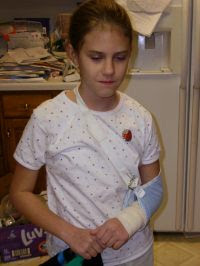 But, happily, Louisa will only have to wear a bandage and a sling for a few days. She probably won't be too happy about this photo on the blog, though. We had a late supper. And during supper a member called to say that his son was being rushed to GF emergency room. He had fallen from the roof while trying to clear the stack exhaust on his house. No body was sure how seriously he was injured. Louisa rode with me to GF. We met the family of the man there and waited to find out how well he was doing. The worst damage he had was a shattered wrist and a broken ulna. He's having surgery Wed. to do the repair work. It is an extremely bad fracture. I'll not post his name. The congregation will know through the family. But please keep him in your prayers. Wed. writing, lesson prep, sermon prep and Wednesday School. Jeremy was home from school today, sick. Stella kept me up most of the night, she is sick. Most of us have some kind of sinus and upper respiratory stuff now. If Jeremy didn't pick it up at school, I probably brought it home from visits. c'est la vie. There were 32 readers of this blog on Monday and 30 on Tuesday. Diatheke had 20 and 12 respectively. 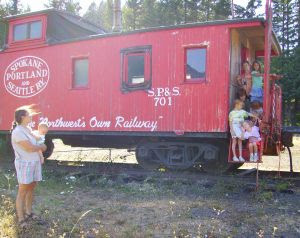 For the family blog we had readers from Boise, Idaho; Gaithersburg, MD; Ft. Wayne, Ind. ; and a bunch from Washington state, Wisconsin, and Minnesota. Who's in Hopkins, or Appleton? For diatheke we had some really inexplicable reads from Cipinangmelayu, Indonesia; in China there were readers from Tangshi, Qingdao, Renqiu, Beijing, and Biaqingzhai; Orzesze, Poland; Resistencia, Argentina; and Jobo, Mexico. Both of these blogs are available only by reference. I don't have them generally available to internet search engines, so the people going to them have to be given the address to get there. Even so, I find it fascinating that there are people in China, Indonesia, Argentina, Mexico, Poland, and England who read the theological writings I've posted. Especially since they have to have found out about them from through someone I've told about the sites. Childhood can be a troubling time of life. The photo does not make clear whether Clara was trying to dive down the laundry shoot and Stella was rescuing her, or whether it was-indeed-Stella the toddler trying to dispose of her sister. All John could do in the background was smile. Runny noses today. I did a handfull of catch-up chores, and ignored two handsfull. I've been itching to finish my bow. But I need a string to use on it for the final shaping and tillering. Since the bow is home-made, perhaps the string should be as well. Well, the string isn't totally home made. 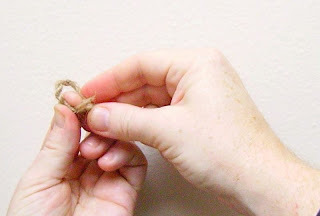 It's 3 ply jute twine that I twisted together in a 2x3 ply string. The plys are hand spun in Malaysia, so, I suppose that counts as home-made. Each ply is 28# test, so each twine is up to 84#. I twisted together two twines into a new 2 x 3 ply bow string. This should test out at about 168#. More than enough for tillering my bow. For actual use, the string is supposed to test out at 4 times the draw weight of the bow. 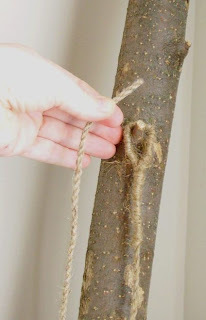 If I want to use a jute string like this, my bow would be limited to 40#. 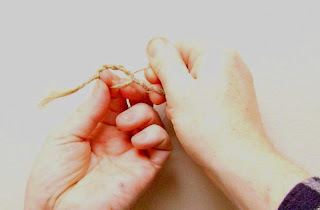 So, anyway, making the string is not difficult, but it did cause blisters on my fingers. 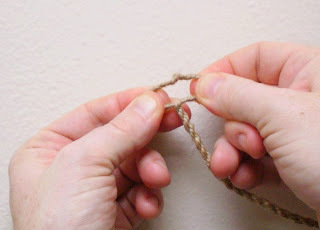 String will twist itself up if you know how to work it. I measured out 3 times the length of my bow. 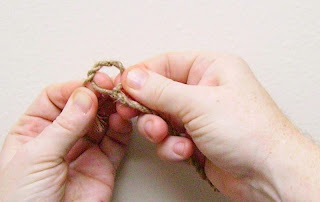 In the middle of this I twisted the string until it folded over on itself and began to twist backward into a 2 ply string. 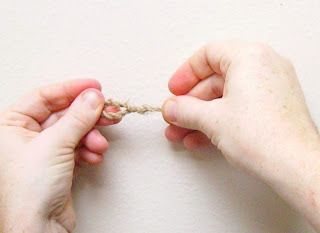 Then, keeping tension on the 2 ply, I twisted each twine clockwise and allowed the 2ply to wind up counterclockwise. The resulting bowstring is not quite 1 and a half times the length of the bow. All the girls and John helped me to make the string, and they were very happy to try to pull on it to see if it could break. But we weren't able to get it to break by pulling. I'll do a real poundage test after I have the bow tillered. In order to make a truely home made string I have managed to spin some of my own threads and yarn from polyester batting. I'm hoping to actually spin some strings from stinging nettle and from spruce roots this summer. But I'll write up how my cheap drop spindle works some other time. We had Bible Study at Nazareth tonight. Afterward I stopped over at Henry and Betty's. Due to some health issues they've had a difficult time getting to church since the beginning of the year. Please keep them in your prayers. It has been a cold weekend. No church or SS at Mt. Olive. I did meet with one confirmand and his family in the afternoon. It was a short drive. But even with three layers of clothing the cold bit through the car seat. St. Petri and Nazareth called off church. Everyone called off Sunday School. Oak Park called all the elderly and told them to stay home. We had 35 communicants at OP today. Most people stayed home. And it wasn't because of the Superbowl. This morning we had 37 below before sunup. At 9:45 it was still lower than 20 below. It wasn't quite cold enough to make snow with a cup of water. We did that a couple of winters ago when we had two days in a row that were lower than 40 below. Yes, you can make snow with a cup of water when it is that cold. Just for fun, we tossed a cup of coffee out to make brown snowflakes that year. It was neat, but it looked like a big brown stain where the flakes fell. The few kids that were at OP sang the first three verses of "By Grace I'm Saved" for the sermon hymn today. They did an excellent job. During this past week I've decided to brush up on my Greek grammar and am reading a couple of different grammars. One of them is Chase-Phillips, the introductory grammar that Prof. Reichwald assigned to my first year class. It's fun to see all the different notes that I put in that book. The highlighting marker companies must have made quite a bit of money off me that year. I remember Prof. Honsey telling me, "If you're going to highlight so much of the textbook, why don't you just use a black marker and cross out the parts you don't want to read?" Ah, yes, but as a first-year college student, everything is important that you read, because everything is new, and everything can be on the exam. And it usually was. I just ran over to the office tonight to make sure the lights were off and the toilets flushed in the church. While I was at it I thought I'd write this up. Some members have found it interesting to see where this blog is read. Well, Friday there were 31 visitors to this site, 47 on Saturday, 17 on Sunday. 25 percent of the traffic came through Pastor Jacobsen's blog. So he has, evidently, listed my blog in his. So, I'm going to put his blog and a couple of others in the links menu on the left side of the screen so you can find out what these others are writing. 4 out of 5 readers are repeat readers. That means that on Saturday, for example, there were 8 new first-time readers of this blog. Here are some interesting new locations for readers: Hunan, China; Toledo, Ohio; Pontiac, Ohio; Columbia; along with more new readers from the mid-west, the pacific northwest, and South-central U.S. If you new readers would be so kind, please send me a note to tell me who you are. My address is ibnabraham at yahoo dot com (change this into a proper email address). Friday evening now, almost Saturday. After our friday evening family time I came over to the office. Two steps past the garage and into the wind my nostrils froze shut. It's 24 degrees F below zero. Add the 10 mph breeze and the moist hairs in your nose think its 30 below or lower. Interesting sensation. Today Alyssa came to do bulletin and secretary work. After lunch I went to do a couple more visits in TR. Louella is doing well. She had some work done on her eye last week and is still recovering. Gertrude is sick. She's 102 years old and has a cold but can't get enough air to cough the phlegm out. Corella, I assume you know what's going on with mom, but in case you don't I put it here for you to see. I'll try to call you or email you tomorrow. Keep Verner and Gertrude in your prayers, they are going through some very difficult times. The last time Verner recognized me was over 2 months ago. Then we had a conversation. It only lasted 3 minutes, but given his state, one learns to value such times greatly. On the way home I stopped at Lorina's. She had eye surgery on Thursday. She's home now and doing well. But she's under doctor's orders not to bend over or lift anything. Keep her in your prayers for a speedy recovery. There won't be church at Mt. Olive tomorrow. The 20 below policy went into effect tonight. From the forecasts and temperature maps it looks pretty certain that it will still be that cold or worse in the morning. The Youth Group outing to Bemis Hill has been postponed one week due to the cold. All you Circuit 8 pastors and guests take note. So, now, I'll finish up my sermon stuff and go to bed. Oh, hey, by the way, I called my mom tonight. She enjoyed the account about Josh. Why did she enjoy it so much? Well, when she was his age she went out to feed her dog on a cold evening. The sun was going down. The dog house was on the far side of the shed from the house. And she saw this latch on the door. She'd heard the other kids talk about freezing their tongues to pump handles and the like. And being a kid who learned more by doing than by believing the reports of others, she stuck her tongue to it. Ooops. "Well," she thought, "if I put more of my tongue on it it should melt quicker." Josh, My mom tore a piece of her tongue out that was the size of a nickel. That's about the same size as the piece of your tongue that I scraped of the bell tower. She bled, it hurt. But she's fine. She healed up really well and fairly quickly. Ask her about it when she comes to visit next time. You and my mom are like blood brothers now. Though, I'm sure we all wish that we could learn a bit quicker by listening rather than having to go through these things. Wednesday began pretty well. I got plenty done in the morning and was prepared well for Wed. School. As a special treat, I got out all my archaeological artefacts and gave a presentation on archaeology to all the students for the last 20 minutes. However, I forgot (stupid me) to give the assignment for next week. Now, I know that the kids know that it's all on the church web page. But, I better call them to be sure they have it. It's my mistake after all. At the end of the presentation we heard a terrible scream of pain, and little Josh came in with his mouth bleeding. I ran over to help, and found that a patch of his tongue's tastebuds were missing. I got him calmed down, and Dawn called up to the house to get Alison. I took him to the kitchen and cleaned him up, having him bite down on folded up wet paper towels. We got the bleeding slowed down. And kept him fairly calm. Alison came and they drove off to the clinic. What happened? 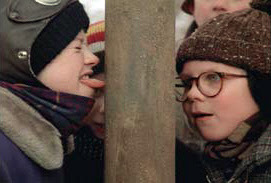 Remember "Flick" in the flagpole scene in the movie “Christmas Story”? As far as I'm able to determine from questioning the kids, Josh asked another boy if he should lick the steel support for the bell tower. He said “No!” turned away to play, and then heard Josh screaming. Afterward I cleaned up as best I could. I went out and got the half inch long quarter inch wide strip off the bell tower and put it in our freezer in case the doctor wanted it. Later, Alison called to say they are doing ok. Josh has some lydocane for his tongue. It's a bit swollen, as is part of his lip. The doc said the tongue would heal fine. Alison said my kids could keep the tongue slab if they wanted. So, well, there's this bit of Josh's tongue in my freezer now. Kinda weird knowing that. It's great to hear from you all.